As another college year begins, many families are in the middle of deciding whether to use student loans to help pay for some of the costs. If done wisely, this can be a useful way to borrow money in anticipation of acquiring skills that will help you land a high-paying job down the road. 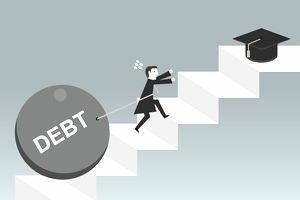 The problems for many students, though, start after graduation when they realize the full amount of debt they have acquired and aren’t able to land the job of their dreams. Payment due notices start arriving and the student is suddenly faced with a mountain of debt. That’s when the student loan scam sharks start circling. These predators prey on students who may be facing financial difficulty for the first time in their lives, so they haven’t done their research on the options that may be available to them. They offer the promise of an easy out and the borrowers jump at an unqualified opportunity to escape the mounting stress. Many harried students pay money for a supposed service, only to find out it is a scam. Not only are they out the money they have paid, they are even farther behind on their student loans than before. There are two types of student loans—federal and private. These are the original entities that loaned you the money for college. Upon graduation, they appoint a loan servicer to handle your payments. It is best to only work with your loan servicer if you are experiencing some type of payment problem. You need to assure yourself that you are getting correct answers as they pertain to your specific loan. You might receive a telephone call, or see something online or through social media that looks or sounds like a good deal. It seems official with something like “government” or “Obama” in the name and offers student loan forgiveness, so you call to find out more. The person on the other end says they can knock thousands of dollars off your student loan bill but will need a few hundred dollars to get the paperwork started. They advise you to purchase a store or iTunes gift card for that amount and ask you to read the number to them. This is the point when you should suspect that something is wrong. Contact only your loan servicer to discuss loan forgiveness options. In the case of federal student loans, there are some ways your loan can be forgiven, but you will not be required to pay any fee in advance for this opportunity. There are legitimate organizations which offer negotiation services, but they cannot charge any fees until an actual agreement has been reached. Many scams charge you money to do things you can actually do yourself at no charge. You can consolidate your federal student loans or search for an income-based repayment plan, and apply at no charge. Visit the FSA website or talk directly to your loan servicer to learn about your options before paying someone else to do this work. This is an old saying, but it still rings true. Be highly suspect of any offer to completely wipe out your student loan debt because this is very hard to do. If they ask for your Social Security number or FSA ID you could be on the verge of getting scammed or having your identity stolen. Can I Find Help with Student Loan Payments?